I am currently driving a 110 mile daily commute in Southern California in my 2012 Fiat 500. I was hoping to get into a Tesla because of their autopilot feature on the freeway. However the autopilot does not work all that well at this time so I am going to look for a car to last me the next three years or until full electric autodriving cars become available. My wife has a lot of issues with seat comfort as a passenger. I need something with power adjustable passenger seats suitable for large people. The best car I have found was a Volvo S90 but that is a very expensive car to operate. 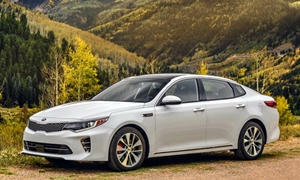 The next best car I have seen is a Kia Optima Plug In Hybrid which could be a real winner for me. I wonder if there is a better car I am overlooking. I like the Buick LaCrosse with e-Assist that Car & Driver got almost 40 mpg at 75 mph. That blows away Toyota Avalon Hybrid at 30 mpg. You can get them for low $30's with comfortable, power seats. Unfortunately, Car and Driver's as-tested mpg varies tremendously based on how they opt to drive the car. I don't believe they use a set method. EPA ratings for the Buick are 25/35, for the Toyota 40/39. I don't think the Buick will be nearly as efficient as the Toyota for most drivers, though it might be in the same ballpark in solely highway driving. And the Kia Optima plug-in? I'm not sure any plug-in that's not a full electric will make sense for someone with a 110-mile commute. The car will run on electricity for the first 25-30 miles, then lug a useless heavy battery pack around for the next 80-85 miles, getting worse fuel economy than a regular hybrid would have. So, unless tax credits make the plug-in cheaper than the regular hybrid, the latter strikes me as a better fit. In my experience the Kia Optima and related Hyundai Sonata hybrids drive well, but aren't as efficient as a Ford, Honda, or Toyota hybrid, especially not in suburban driving. 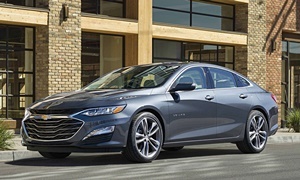 The Chevrolet Malibu hybrid also has fairly strong EPA ratings, but I haven't personally tested it. Among these, I expect the upcoming 2018 Honda Accord hybrid to drive the best and get excellent fuel economy (EPA ratings should be around 50), but seat comfort could be an issue. It might also be discounted considerably less than a Kia or Hyundai, especially at first. If you are set on a plug-in, the Honda Clarity might be worth a look if it's available where you live. It can go 45-50 miles on the battery alone. Its styling is...interesting. 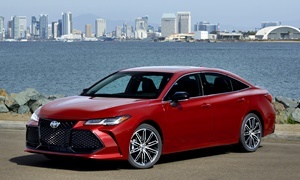 So, my recommendation is to check out the various midsize hybrids--Camry, Sonata, Optima, Fusion, Malibu, and (when available) Accord--and see which you and your wife find to be the most comfortable. Also check how much dealers are discounting them. Maybe also the Buick LaCrosse suggested above, though it's considered a "mild hybrid" unlike the others because its electric motor is very small and can only assist the gas engine rather than power the car on its own (hence the smaller mpg benefit). Accleration is relatively tepid. On the positive side of the ledger, the Buick's seats might be more comfortable than those in the less expensive cars. And maybe also the Honda Clarity. C&D set method is 200 miles round trip in a Michigan 70 mph zone doing 75 mph and they got 38 mpg for the LaCrosse with e-Assist.. Consumer Reports got 39 mpg for a LaCrosse with e-Assist but they won't delve into their highway testing methods. Malibu Hybrid also saw 50 mpg highway in CR testing. 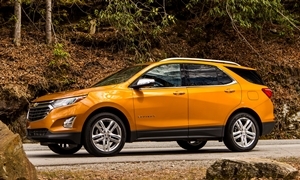 The GM Ecotec 2.0T will see 40 mpg highway at the speed limit. The Ecotec 1.5t will see in the 40's mpg highway. C&D test a Equinox Diesel on their 200 mile highway run at 75 mph and got 48 mpg....with AWD. I've heard from several places that noise isolation and ride comfort in the Volvo S90 are not up to par. It is a beautiful car, though. NormT lied. The Avalon Hybrid got 39 MPG on the Car & Driver test, not 30, and is rated for 40 MPG combined. 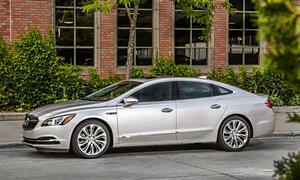 The Buick LaCrosse saw 38 MPG on the highway test. The Buick hybrid powertrain is not tried and true, unlike the Toyotas, which are proven to be some of the most reliable cars on the road. Fuelly is a good website to find actual MPG data because you can get testing based on over a million miles of many owners. EPA figures are not always correct. With C&D, they drive on a freeway sometimes in below freezing conditions, which hurts MPG a lot. I see this a lot with CR in Connecticut where MPG ratings are sometimes 8 MPG below city ratings. On SoCal freeways, hybrids are the #1 cars for the best MPGs. That is why we see so many Prii. When you are in heavy traffic, the engine is off for most of the time. This is when I can get 70 MPG in my 2016 Prius. In another car, like a Camry or Accord, you'll probably see 18 MPG if the traffic is really bad. My mom bought a 2017 Toyota Avalon Hybrid Limited last year and she loves it. She used to have a Jaguar, but she prefers the Toyota because of the level of comfort it offers and the abundance of safety tech. She has a lead foot and gets 42 MPG. This car perfectly fits your description. Every safety feature except blind spot monitoring with rear cross traffic is standard on every trim. The car rides like it is on a cloud and the seats are wide and comfortable. Car & Driver's verdict was that it had "Lexus-level comfort without the pretension." The car even has back seat heaters with their own auto climate control. Where the car falls short is in handling because it has a soft suspension setup. The Avalon is a Lexus ES without the Lexus badge, which costs 8k+ extra. The other downside is that a new Avalon just debuted at the Detroit Auto Show and it looks like a big improvement aside from the giant grill. The car isolates you from the road. This is good if you want something comfortable and quiet, but not if you want driver engagement. One nice feature that the Camry and Prius have is that the Adaptive Cruise Control is full speed. I love this feature because I never have to touch the pedals in stop and go traffic. Most cars with ACC don't have this. The Avalon has ACC that operates only above 15 mph or so. Some other good ones are the ones that mkaresh mentioned. The Kia Optima is a great value, offering many features for less than the competitors. The Accord is simply the best midsized sedan on the road. The Camry is nicer than the Optima, almost as nice as the Accord. 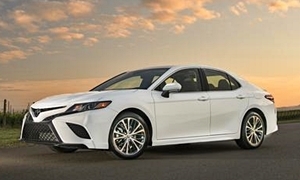 The Camry will be more reliable than the Accord or Optima. 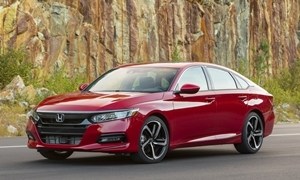 The Accord will likely have first-year reliability problems. The Sonata Hybrid is also worth a look. Don't forget that the LaCrosse doesn't have standard safety features. The LaCrosse has a 1 out of 5 rating for reliability on Consumer Reports. The Avalon has had 4 or 5 out of 5 every year since 2000. The owner satisfaction has consistently been considerably better with the Avalon than the LaCrosse. The Buick will not get better MPG than any full hybrid. You could of course wait for a Tesla Model 3 or maybe a used Model S. If you send Elon Musk a tweet asking him if he can incorporate something in the next software update, he sometimes responds if he will do it or not. That's really cool that a automaker CEO grants people's requests such as wanting a better navigation map or Autopilot updates. I've seen at least 15 Model 3s on the road and every review I've seen has raved about it. Good luck and please tell us what you get! All of these cars are better than the Fiat 500. For long highway drives thr battery level must drop and fuel economy suffers on thr Avalon Hybrid from Car & Driver. "The net result is 40 mpg city and 39 mpg highway, according to the EPA?not bad for a 3635-pound sedan. You will probably not be surprised to learn that in our test, fuel economy didn't quite measure up to the agency's forecast. We logged 30 mpg in mostly freeway driving?brisk freeway driving?that included a 500-mile round trip to Chicago." The battery doesn't drop at all. It stays constant when traveling at a constant speed. In stop and go traffic, it is actually perfect because you can use the energy generated each time you brake for EV power when accelerating. The LaCrosse eAssist mild hybrid got 38 MPG on the "75-mph highway fuel-economy test." The Avalon Hybrid got 39 MPG on the same test. You compared the normal 200 mile MPG test done in Michigan with the Buick and compared it to a different 500 mile MPG test done in Chicago with the Avalon. You have to compare the same test, apples to apples. The C&D MPG tests really don't mean much (200 miles on cruise control on I-94 in different weather conditions). Fuelly says based off of 233,000 miles of driving, Avalon Hybrid owners are getting 37 MPG combined city/hwy, which is a little below the EPA's 40 MPG combined. Buick LaCrosse eAssist owners are getting 23-25 MPG based off of around 50k miles. Looking at the government ratings, LaCrosse eAssist is 25/35 MPG and Avalon Hybrid is 40/39. The city rating is much worse for the Buick, which also means it will not perform as well in stop and go SoCal commutes. Toyota has had this powertrain for a long time because people like it. Reliable, efficient, and refined. The Buick, like mkaresh said, is a mild hybrid and is more of an afterthought. This review got 37 mpg over 500 miles on the old LaCrosse with eAssist. The new one has a bigger battery and multiple speed transmission. The LaCrosse and it's better warranty actually competes with the Lexus ES and usually has won the comparison since a redesign in 2009. It's full economy is no better than the warrantied Toyota which it shares thr same platform. Although the EPA rates the Lexus at a lofty 40 mpg combined, we fell far short of that and averaged 26 mpg overall, just 1 mpg better than the last ES350 we tested. Better numbers surely are possible with a lighter foot, as proved by the ES300h's 37-mpg result in our 75-mph highway test (just 2 mpg shy of its 39-mpg EPA rating). That's still 4 mpg less than a conventionally poweredBMW 330i's impressive 41-mpg result in the same test. This hybrid's purported advantages are eroding as competitors' nonhybrid drivetrains improve." There is a $6,000 savings on the LaCrosse over the Avalon which will realized in the difference in fuel economy. There is $2,000 to current GM leasee but ask for a Conquest Bonus to cover it. New 2018 Buick LaCrosse Preferred for sale at Baytown GMC Buick in Baytown, TX for $25,200. View now on Cars.com. 48 mpg from the Equinox diesel surprised me, since I just had the Terrain diesel and could manage "only" 41 mpg on the highway, and that might have been going with the wind. (It was cold, though.) On the return trip a few days later I managed only about 31 mpg, but I definitely had a headwind then. Anyway, I checked C/D and they observed 43 mpg, not 48 mpg. This is in line with my own observations. Still excellent, but not 48 mpg. Also, for what it's worth, I vastly prefer "misremembered" to "lied." 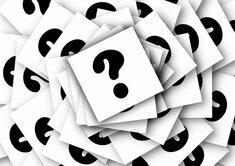 The human memory isn't the most reliable--I see far too much evidence of this every day. When you can't prove your argument/support your ego, just place blame? Allot more choices for fuel economy today than economy cars. When I'm stuck in a vehicle for hours daily, I used to have 120 mile commute-mostly highway, I want the quietest cruiser possible because eventually we all lose some hearing sensitivity.